Northern Ireland – a grand place so it is! When I left Northern Ireland in the mid-60s to seek my fortune, I had no inkling that I would never live there permanently again. I think that, like most young people starting out on an adventure, I just wanted out, away from the constraints of what at that time was a very conservative society and to escape the claustrophobia of living on a small island. But I always thought that at some point, when I’d “sown my wild oats” I would come home to settle down. Ah, but fate had other plans and there were times during the ensuing decades that I didn’t make it back to “Norn Iron” for years at a time. Age and maturity change a lot of things though and in the past few years I’ve rediscovered my love for that part of the world, the wild beauty of Ulster and the “watta ‘boutcha love!” (transl. : “how are you today dear?”) friendliness of her people. I try to get home at least once a year, usually spending a couple of days in Co. Sligo with sisters Maureen & Cathy (the “Mamas”). 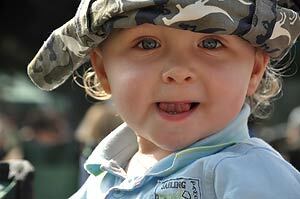 And of course there is now also the added tug of “the wee man”, my 17-months old great-nephew Matthew – what a doll! During this trip, time was too tight for a trip to Sligo so I stayed in the province, spending time with my family and visiting the beautiful area around Newcastle and the Mourne mountains and the stunning landscape of County Antrim. The first Sunday I was home, we packed a picnic lunch and headed off to the grounds of the stately home at Mount Stewart, near the town of Newtownards for Jazz in the Park, an event which goes on there on the last Sunday of each month from May to September, weather permitting. The weather was glorious and it was a relaxing way to “arrive” and recover from the previous day’s travel. 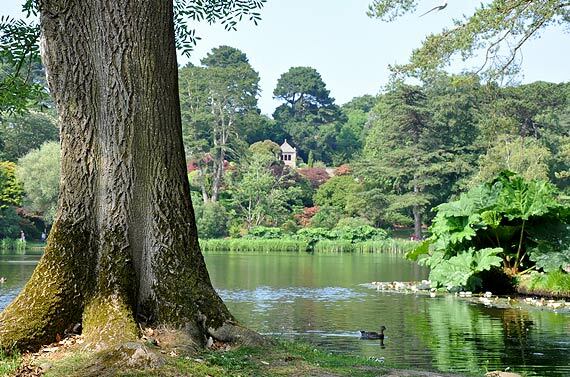 The grounds and gardens of Mount Stewart, well kept by the National Trust, are palatial and it is a beautiful place just to spend the day. Although the name Bloody Bridge evokes images of battles fought on this site, it is not known how this wild coastal area derived its evocative name. Various authorities will attribute it to a massacre in the area about the time of the 1641 Rebellion after which the stream is said to have run red for two days. (An historic old bridge stands across the road from the car park a short distance upstream of the present road bridge). This is a popular starting point for walkers trekking along the ‘Brandy Pad’, a route taken by former smugglers intent on evading the coastguard or revenue men with contraband, mainly from the Isle of Man, brought ashore and transported on ponies across the mountains to the Hare’s Gap, and then onto Hilltown to be distributed further afield. Nearby ‘Maggie’s Leap’ is an impressive chasm cut into the rock by the crashing waves of Dundrum Bay, but unfortunately not accessible from the land. It is said that a young local girl named Maggie leapt from one side of the chasm to the other as she was being pursued by a suitor (or a soldier, or a bull, or a witch, depending on which version of the tale you care to believe). Maggie was carrying a basket of eggs when she performed the jump, but not one of the eggs was broken. More information on this beautiful area on Wikipedia. Where the Mountains o’ Mourne sweep down to the sea. As to how the fine ladies in London were dressed. They don’t wear a top to their dresses at all! Well, here he is now at the head o’ the Force. To be back where dark Mourne sweeps down to the sea. There’s beautiful girls here—oh, never mind! A beautiful, shorter and more modern version on YouTube. 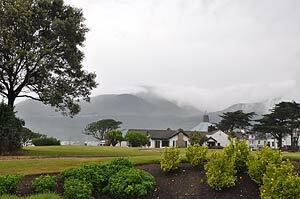 As a special “girl’s day away”, my sister Maureen, my niece Lorraine and I decided to pamper ourselves with a Spa day and an overnight stay at the majestic Slieve Donard hotel in Newcastle. Although the weather left much to be desired, we were happy enough to enjoy the steam room, Jacuzzi and a massage after a stroll down Newcastle’s main street. Price-wise it was a little out of our league (well, for more than one day anyway) but well worth the splurge! 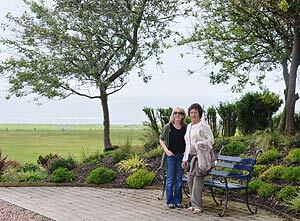 Hot on the heels of our trip to Newcastle, Lorraine left us with our “other sister” Cathy and the 3 of us re-united “Mamas” headed north along the Antrim Coast to Bushmills where Cathy had us booked into the Smugglers Inn Bed & Breakfast for two nights (see my online review here). I had forgotten how stunning that coastline is so even though the weather was still a bit changeable, we had to stop for regular photo ops (thanks to Cathy and Maureen here for their patience with this budding photographer!). After a good night’s sleep and a hearty breakfast at the Inn we set out to explore, heading first into the little town of Bushmills, famous for its whiskey and what is reputedly the world’s oldest “legal” distillery, founded in 1608. If you get the chance, step into the Bushmills Inn for afternoon tea or some typical Ulster fare – it’s worth it just to spend some time soaking up the atmosphere set by the Nooks and crannies, gaslights and open peat fires. After a “wee packle” (Ulster-speak for a little stroll) around Bushmills, we headed out to our next destination, the Giant’s Causeway. This well-known natural basalt rock formation was declared a World Heritage Site by UNESCO in 1986 and is sometimes known as the 8th wonder of the world. 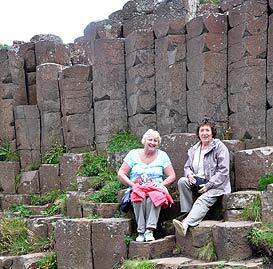 Although the unusual hexagonal stone formation was historically caused by a lava eruption about 80 million years ago, I still prefer the stories of how the Causeway was created by the Irish giant Finn McCool to make it easier to meet up with his Scottish rival, the giant Bennandonner! A short bus ride from the Visitor’s Center takes you to the main Causeway from where one can walk to the various formations such as the Giant’s Boot and the Chimney Stacks. Our bus driver, after testing the bus’s microphone to make sure it was working, then proceeded to give us a brief, entertaining and VERY LOUD introduction to the area (without using the microphone at all – he obviously decided he didn’t need it!). Unfortunately, the weather took a short turn for the worse when we arrived at the Causeway so, apart from scrambling over the nearest rocks and, of course, taking a few photos, we didn’t do much hiking around, preferring to keep our energy for our next destination, the Carrick-a-Rede rope bridge. 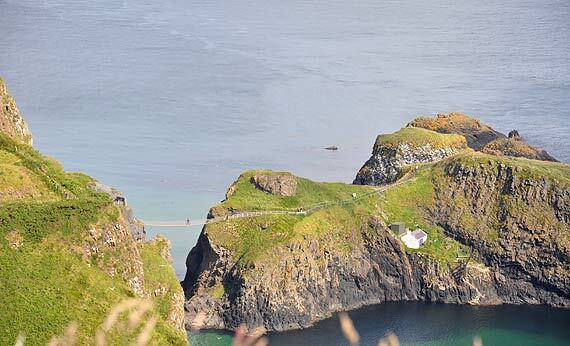 After stopping off at the tiny harbour of Ballintoy to fortify ourselves with tea and scones, we made our way to Carrick-a-rede, checking the skies before deciding whether a walk down to the bridge and across would be a wash-out or not. Luckily the grey clouds had cleared away so we set off on our hike, and a fairly strenuous one it was too!. The first part of the walk is on level ground, with a few minor downhill and uphill stretches; then come the steps leading down to the bridge. Not so bad going down, but a bit of a heart-pounder coming back up! But it was worth it. 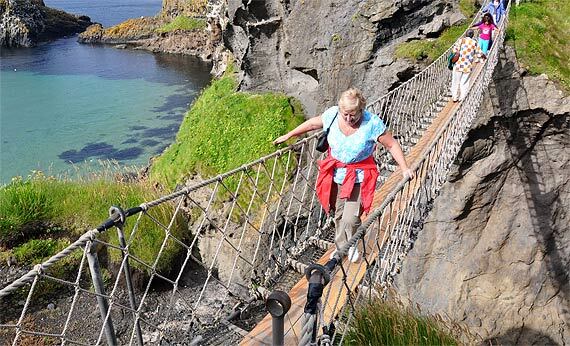 The rope-bridge, once used by fishermen to carry their catch across from the fishing grounds to the mainland, spans a chasm 80 feet deep – definitely not for vertigo sufferers! 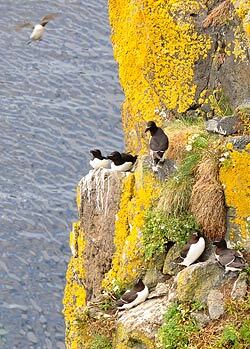 Just across the bridge there is a spectacular view of the headlands and the steep cliffs which provide an ideal nesting haven for a myriad of sea birds. On the way back, we took a walk to the top of the cliff path leading down to the stunning golden sandy strand of Whitepark Bay, one of the most beautiful and untouched beaches I have ever seen. As a young backpacker, I stayed at the Youth Hostel there which, at that time, was a tiny whitewashed cottage a steep climb down the cliff. A new modern Hostel has now been built at the top of the path and the old Hostel closed, apparently because of vandalism. Other attractions of that beautiful part of the world include the Glens of Antrim which we passed but for lack of time couldn’t visit. 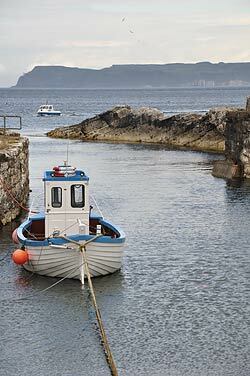 From Ballycastle, it is a short ferry ride to Rathlin Island which sits like a stepping stone between the North Antrim coast (4 miles) and the Mull of Kintyre in Scotland (16 miles). It’s a haven for birdwatchers, wildlife spotters (there are auks, gannets and gulls with even a chance of porpoise or dolphin sightings) and those seeking a quiet spot to enjoy walks and an evening pint in the pub with the locals. I have long intended to put “Norn Iron” on my list of favourite places and now, after my wonderful visit home this year, seemed the best time to get down to it. I have many friends all over the world who love Ireland but I’ve found that, for the most part, their affection for the island is limited to the Republic. 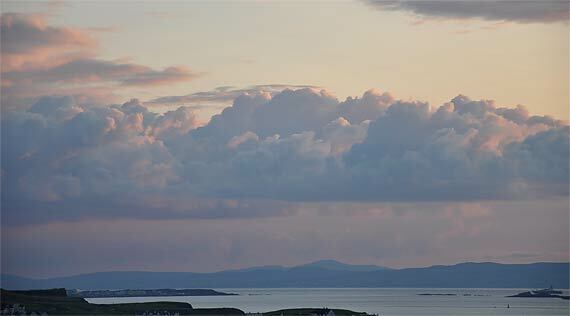 Everyone and his grandfather has been to Killarney, the Cliffs of Moher, Galway Bay and Connemara and it is easy to get the impression that Erin’s beauty stops at the border. Clearly, the lingering echos of the Troubles have gone a long way to scaring off potential visitors to Ulster even though, in all the years that the conflicts were going on, I don’t think that one tourist was hurt. But that is beside the point. Ulster is well on the road to recovery and the days of indiscriminate bombings, tanks and armed soldiers on the streets are a thing of the past. In all of this, the wonderful humour and hospitality of the Northern Irish people and the amazing beauty of the province has survived unscathed. You only need to take a walk along the surf at Whitepark Bay or have a total stranger stop you on the street while you’re studying a map and ask “Where’re ya headin’ for, love?” and you’ll know what I mean.